Cuba was unfortunately hit hard by IRMA in 2017 and you should check up here to see how the island is coping. Cuba is a very large island the biggest in the Caribbean. It has a most unique history and currently if you travel through Cuba you will not feel that you have been here before. Spend some time each end of your trip in Havana 5 days would be enough in total but longer doesn't hurt. Check out Vinales to the east of Havana, don't bother going to Varadero though the beach is nice there are nicer places with comparable beaches. Varadero doesn't really feel like Cuba. Overheard 'Havana in places is like a bomb hit it and no one cleared up' - this is somewhat occasionally true (becoming less so daily) and you should welcome this approach to urban development, in places of course it is swish and swanky like the nacional hotel on the malecon. Take a look at our resorts and scuba diving outlets in Cuba. Trinidad and the nightclub in a cave are good to do there is also a cave tour by night in Cayo Guillermo where bats fly around as you party. Trinidad has nice beaches and the most preserved beautiful colonial architecture. Some people do a tour from Varadero that must be tough to know that you visit a really nice place for a day and get carted back to Varadero. Las Terrazas is an eco resort worth a visit. Way out on the other side of cuba is Baracoa, where an old run down town with baseball stadium on the beach and fishing villages close by go to Baracoa if you can. Staying in casa particulars should hold no fears its a very controlled licensed system and should be used to support this local cottage industry. Make sure you visit a cigar factory and check out the real local scene on the malecon. Casa de la musica is a bit touristic in havana. Diving The diving is fair but not exceptional due perhaps to overfishing as they have national parks in place to protect things. Maria La Gorda is a descent resort mainly for divers but a couple of days of doing not much for non divers would be ok. More than 5 days here would get boring as all the dive sites would have been done. The equipment available to rent is of very poor quality and better to take your own. Its not a country you should go to dive in specifically but for sure go and have a dive if your there to visit the country. Isla de la Juventud was not dived by the author and it is supposed to be the best, not so quickly accesible you have to really want to go there. And for me at the time the country was far too interesting to make a special detour. BUT DO GO TO CUBA ! When to Go Year Round bear in mind.Hurricane season is June to November IF one hits. Cuba Backpacking - a guide to some of the best destinations in cuba especially for the backpacker. Forget the all inclusive cuban holiday - take your soul on a time travel. It can be a good way to get around in Cuba by renting a car. The Scuba Diving in Cuba is worth checking out if you are visiting the country but this author believes that there is better scuba diving if you just want pure diving to be had in the Caribbean. Well if you go to Cuba then renting a car could be a good way to get around, backpacking on a bus proved fine when I was there, but I have to admit that there were some spots better reached by car. Still you can always hire cabs or collectivos as they are called! When you get to your cuba destination why not check out a casa particular ? Its really a good way to get into cuba very safe and regulated and very homely. A perfect example of Cuba and her originality ! Private property sales are about to make a comeback in Cuba for the first time since they were outlawed by the government after the 1959 revolution. The BBC's Michael Voss meets one couple desperate for a place of their own. Mario Perez and Lilian Carballo were married for 11 years before they broke up about 12 months ago. They still see each other every day. But out of necessity, not choice. Their story is not unusual in Cuba, where divorced couples stay under the same roof because they have nowhere to move to. And it is not uncommon for three generations to live together in a tiny apartment. 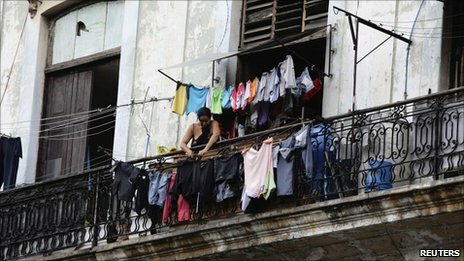 Cuba, with its population of 11 million people, has a shortfall of about 500,000 homes. Much of the existing housing stock is run-down and in need of repair. The Communist Party Congress in April agreed in principle to allow people to start buying and selling homes and cars. Now the government has started fleshing out some of the details and says that the changes should be in place by the end of the year. "It's difficult living together, " said Lilian. "Everyone has their own habits; some are tidier than others. It's OK when you are in love but afterwards such things become really annoying." By Cuban standards, Mario and Lilian's first-floor flat is relatively spacious with a small balcony off the living room. They share a tiny kitchen and bathroom but do have separate bedrooms. It was a relatively amicable divorce and at least they remain on speaking terms. The pressure, though, is hard to bear. "It's all about respect. I can have a girlfriend but I can't bring her home just as she can't bring a boyfriend here. It's one of the conditions we jointly agreed on, " said Mario, a jazz and rock drummer who is struggling to make ends meet. The island of Cayo Largo is approximately 177 kms south of Havana City and the mainland of Cuba. It is part of the archipelago De Los Canarreos group of islands. Christopher Columbus discovered these islands during his second voyage to the New World. The island of Cayo Largo is surrounded by limpid, calm water of different shades of blue as its depth changes. Combine this with the fine creamy white sand and it all goes to complete the peace and quiet of this island in the Cuban Caribbean that is Cayo Largo del Sur. An island that is rewarded by nature to give plenty of rest to all who visit it. - that is if you're lucky enough. A 5-star luxurious and all inclusive hotel located on the Varadero Beach on the Caribbean Island of Cuba, your visit to the Iberostar Varadero will be a definite memory to never forget.